Blueberries have burst onto the home gardening scene in recent years and have gained a reputation with nutritionists as a food with significant health benefits. The crop is easy to grow, if some special requirements are met. Blueberries are also known as high-bush blueberries to differentiate them from low-bush blueberries. Both kinds, different species, are grown in North America, where they are native, but only high-bush blueberries are grown in Europe. The high-bush types are capable, in ideal conditions of reaching to well over two metres tall, but are generally pruned to keep them smaller and for ease of picking. Blueberries are related to the wild fraochan or bilberries that grow on moory soils on bogs and mountains in many parts of the country. 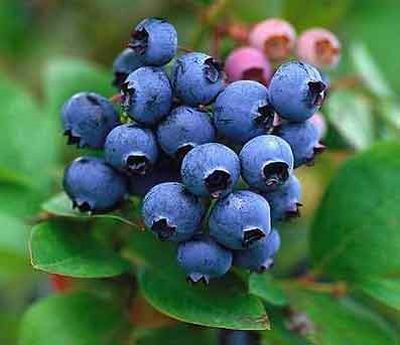 The fruits of the blueberry are similar in appearance and taste to the wild fruit but much bigger and usually sweeter. Most people are very familiar with blueberries because they are now widely available as imported fruit form America and other countries. There are some commercially grown crops in Ireland and the fruit from these is also supplied to fresh fruit outlets. The key to success with blueberries is to provide the acidic soil conditions that they need. The soil acidity needs to be below pH5. This is only available in very acidic soils such as those derived from bogland and acid soils in Wicklow, Wexford, Carlow, Waterford, parts of Cork, Kerry, Galway, Mayo, Donegal, and across Northern Ireland. But even in those areas, soil that has had lime added for vegetables to grow at pH7 and other fruit crops to grow at their preferred pH6.5 will be too limy. Most of the soils in the midlands are naturally too limy. The test would be if the hydrangeas in a garden are blue, then blueberries can be grown in the open soil. If the hydrangeas in the area are not blue, it will be essential to test the soil using a pH test-kit, and these are available from garden centres and they are adequately accurate. If the soil acidity is suitable, the plants can be grown in the open ground and this is the best way to grow them because they can root out properly and take up the nutrients and water they need. If the soil is too limy, it will be necessary to grow the crop in large tubs or pots, or in polythene-lined pits. The bigger these containers can be the better to encourage plenty of good growth. Plants grown in limy soil suffer nutrient deficiencies and the foliage turns yellow. In soils that are border-line, heavy mulches of acidic material, such as pine or spruce needles can help to acidify the soil and sulphate of iron can be used as a dressing to reduce pH and to supply iron to the growing plants. Blueberries are supplied in pots and can be planted at any time. The traditional, and best, planting time is the autumn when the leaves have fallen. The plants usually need about one metre or more apart. Although the crop likes moist soil and must have moisture through the summer months, it also needs soil that does not become waterlogged in winter. So choose a spot that is not prone to waterlogging. Frost in spring can cause damage to the unfolding buds and severe frost can damage the bark of the stems and to avoid this, plant blueberries higher up a slope rather than at the bottom where frosty air can gather. There are lots of varieties but the most commonly available are likely to be ‘Earliblue', ‘Coville' or ‘Bluecrop'. In many cases, the plants are not named at all, but it is a fair assumption that those made available are suitable. Blueberries do not carry fruit until the bushes are four years old and it is usual to plant two- or three-year old bushes to fruit the following year or perhaps the year after if they are small to start with. The bushes are self-fertile and one bush can be grown on its own, but two varieties provide better pollination and fruit set. Blueberries are surface-rooting plants and do not compete well with heavy weed cover. Hoeing or any form of cultivation tends to damage the feeding roots and weed control is best achieved by using a heavy mulch, ideally of acidic material such as pine or spruce needles or any conifer, and chipped bark mulch can also be used. The mulch can be as much as ten centimetres in depth and topped up every year or two. The ground must be weed-free before mulching and the mulch will help to keep the soil moist during the summer months. The crop needs adequate moisture when in growth and especially coming up to fruit swelling and ripening. Normal rainfall is usually adequate across most of the country, except for the drier eastern areas, but in dry spells of more than one week the plants will need heavy watering, at least twenty-five litres per square metre. The water used must be lime-free, which may mean using rainwater in limy areas. Watering is the key to success in containers or pits and must not be neglected. Blueberries also need feeding each year to encourage the new growth on which the berries are carried. The bushes produce new shoots on which flowering twigs are carried after one or two years. The crop needs quite a bit of nitrogen and this is best supplied as sulphate of ammonia. It also needs sulphate of potash for good fruiting. About 15 to 30 grams of each are applied each spring over the surface mulch. Pruning is not needed for the first three years, except to shape the bushes a little. After that, some of the older shoots can be removed at, or close to, ground level, in the same way as for blackcurrants to encourage new shoots from the base. About one in four shoots should be removed in this manner each year to maintain a rotation of new wood, which carries the biggest fruits, and to keep the bushes to a neat size. The fruits normally begin to ripen in late July and August, depending somewhat on the weather earlier. The crops opens its white bell-shaped flowers in succession in late spring and the fruits also form in succession. The first flowers produced fruits that ripen first and these can be ripe while the later ones are still quite small and green. The ability of the late fruits to ripen depends on the weather and they can drop off without ripening if the weather is poor. The first fruits are the largest and juiciest. Ripe fruit is dark-blue with a waxy bloom and it is usually ripe about one week after it turns colour. Prematurely picked fruit does not ripen properly and can be very insipid. The plants need to be picked over regularly during the fruit ripening period. Excess fruit can be held in a refrigerator for up to one month, or frozen or pulped and frozen as pulp or juice. Blueberries are generally free of pests and diseases. The main pest is birds which are very fond of the ripe fruit and it may be necessary to net down the bushes to keep them out. The only disease that occasionally arises, especially in a wet summer, is grey mould disease, but if the bushes are planted in an open, but reasonably well-sheltered spot, this should not be a major problem. If rotting is a constant problem, reduce the nitrogen feeding somewhat to toughen the fruit.